Google isn't just the 800-pound gorilla of online search. It's now an $800 stock too. Shares of Google parent company Alphabet (GOOGL) hit an all-time high Tuesday of more than $813 a share. The company is now worth $555 billion. Alphabet's stock is up just 4% this year though, in line with Apple. So Google has lagged the performance of two other members of the so-called FANG of four in tech. Amazon (AMZN) -- also at an all-time high -- is up nearly 15% while Facebook (FB) has soared almost 20% this year. Netflix (NFLX) is the only laggard in the group. Shares are down about 20% so far in 2016. But even though Google/Alphabet hasn't surged as much as some other big techs, there is no denying that it is doing extremely well. Part of that has to do with the fact that investors are embracing most large tech stocks in general. The Nasdaq hit an all-time high Tuesday -- its first since July 2015. But Google (is it OK if I just call it Google?) isn't just riding the Nasdaq's coattails. The company is still growing at a rate that would make most companies envious. Analysts are forecasting that profits will increase more than 15% this year and that sales will be up 20%. That's truly remarkable when you consider just how colossal Google is. Sales are expected to top $88.5 billion this year and exceed $100 billion in 2017. It has now been a year since Google announced that it was reorganizing into Alphabet. Since then, the company has continued to post solid gains in its core Google search business, as well as YouTube and Android. But the startups in the Alphabet empire -- companies that the company classifies as "other bets" -- continue to lose money, despite healthy revenue growth. 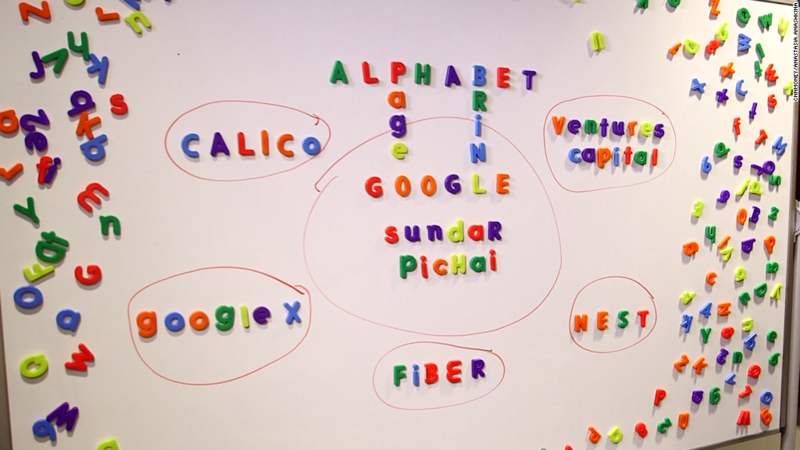 The "other bets" division includes the Google Fiber Internet access business, connected home device unit Nest and its life sciences division Verily. Investors continue to express hope that many of these so-called moonshots will eventually pay off handsomely. But investors also seem less worried that Google will continue to plow money into unprofitable businesses indefinitely. That's because the company's chief financial officer, Ruth Porat, has promised more fiscal discipline at the company. Porat, who Google hired away from Wall Street investment bank Morgan Stanley (MS) last year, has won raves from analysts and investors. She, along with executive chairman Eric Schmidt, are viewed as the financial reality checks for the pie-in-the-sky dreams that Google co-founders Larry Page and Sergey Brin continue to have. Along those lines, Google is widely reported to be working on a deal to sell its Boston Dynamics robotics division to Toyota (TM). So Google may have more room to run. And while many investors are more enamored with Amazon and Facebook because of how rapidly they are growing, Google is no slouch either. It won't be a huge shock if Google's stock crossed the $1,000 level within the next few years either -- rarefied air that only a few companies, including Warren Buffett's Berkshire Hathaway, trade above. Wall Street analysts currently have a consensus price target of $943 for Google. That's nearly 20% higher than current levels. At that price, Google would be worth nearly $650 billion. It's why some think Google could be the first U.S. company to one day top the (say this like Dr. Evil) ONE TRILLION DOLLAR mark.